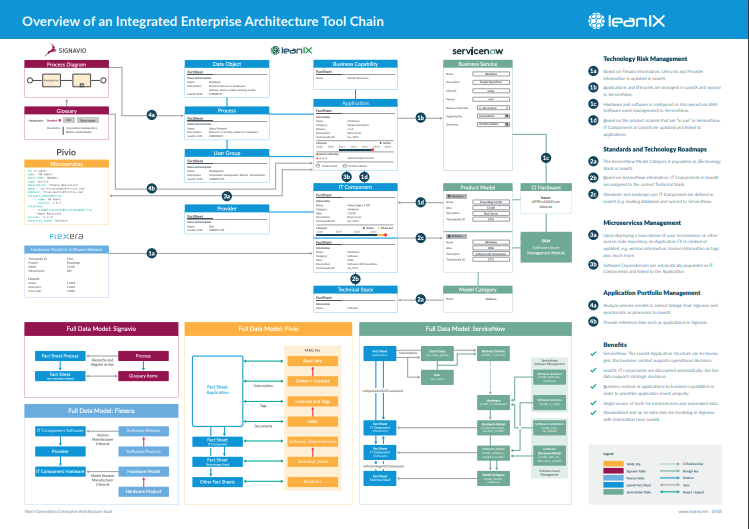 This poster illustrates how we bridge the gap between Enterprise Architecture (EA), IT Service Management (ITSM), Business Process Modelling and Notation (BPMN), Microservice Management and Lifecycle Management. Find out an integrated enterprise architecture can help you with topics such as Technology Risk Management, Standards and Technology Roadmaps and Microservices Management. Single source of truth for microservices and automated data. Standardized and up-to-date data for modeling in Signavio with information from LeanIX. ServiceNow: The LeanIX Application structure can be leveraged; the business context supports operational decisions.